Here are the works I brought to Gwangju, Korea for the 2012 International Women Artists' Exhibition, September 7 through 26, 2012 at Geumnamro Annex of the Gwangju Art Museum and the Geumnamro Metro Gallery, which is actually an exhibition space in the Gwangju metro underground transit. Gallery office address: B2,21-8, Geumnamro 4-go, Dong-gu, Gwangju, South Korea. Thanks to Noh Jung-Suk, General Exhibition Director, Jeong Soon-Yi, Chair of the Exhibition Committee, and Kang Un-Tae, Mayor of Gwangju city; all envisioned and made this exhibition possible. Special thanks to staff including Lee Ga-Yeon, Programmer, An Kyeong-Mi, Coordinator, and Lim Li-Won, Coordinator; all provided for the comfort and opportunities to experience Gwangju for over 42 artist visitors. An exhibition catalog is available. I am including artists' works, statements and links to the websites of each. At the very end is the image of my new stencil edition; I brought a few of these as gifts for my hosts, along with some samples, and gave the gallery a can of (art) spray paint as well. Art is a bridge for me between my inner spiritual life and everyday existence. This work represents the result of the search for an inner spiritual realm that is luminous in structures of light and color revealing the secrets of the universe. The integral forms in this painting represents an attempt to capture the essence of the hidden organizing processes of formation—from the tiniest cellular microbe to the vast universe of galaxies. Much of my artwork is based on an interest in metaphysics, archaeology, and the physical sciences, exploring spatial concepts, underlying structures, healing, transformation, and cycles of existence. Topographic maps appeal to me because they are created by physically active scientists and engineers who document the terrain directly by walking on it. Intimacy with a place affects our relationship to it. I try to see as much as I can most of the places I depict. Here I work with an older map of Ft. Lewis and McChord Air Force Base, now Joint Base Lewis McChord, showing some landmarks which no longer exist. I was struck by the temporal nature of this document and the evasiveness of the geography to reinforce a static view. Visiting the Korean South Sea area in June 2011, I witnessed the dramatic impact of Typhoon Maeri with massive flooding and loss of life and livelihood. JBLM dominates the landscape in Western Washington state: there are always traffic jams on Interstate 5 and the social costs of war are constantly present. I would like to create a different visual language referring to many traditions including maps, classical and middle eastern mosaics, decorative art, textile design, indigenous paintings and shrine technologies of many cultures. The term biocenology characterizes this interface of cultural and natural systems because it is the study of communities and member interactions in nature; it is an exploration of systems, part of the science of ecology. Currently I work with acrylic, encaustic, mixed media and printmaking approaches. I am trying to express the complexity of overlapping multiplicity and the tendency of natural processes to pursue cycles of life. A snowman is a benign character, and product of the natural world and childlike imagination. I think of them today as an endangered species, a bellwether of climatic change and global warming. 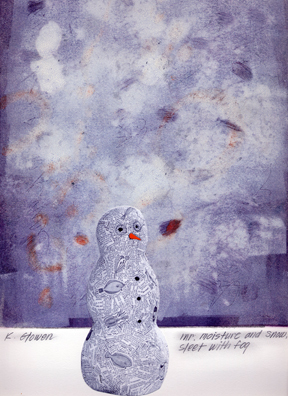 A snowman is also an alter ego, a temporary sculpture subject to the whim of both cold and warm. The work is a continuation of my use of dictionary fragments and images to represent ideas as well as shapes. My encaustic and oil paintings have developed from juxtaposed jabs of color and line that create deep space and lead the eye into submerged light. Grids’ webs connect points, create dimension, and travel in time. The imposition of the grid melds layers and intersections; color fields transverse the paintings, around surfaces and perimeters. Layers of grids, color and translucence, like layers of information, are all different, directional, yet connected, to take on a seamless quality. Variant luminosities cross one another, yet convene. 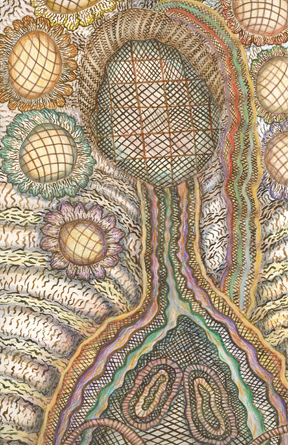 Grids, dots and their trajectories open to show us what is happening beneath the surface. The body as landscape, energy and the interconnectedness of all are ongoing themes. 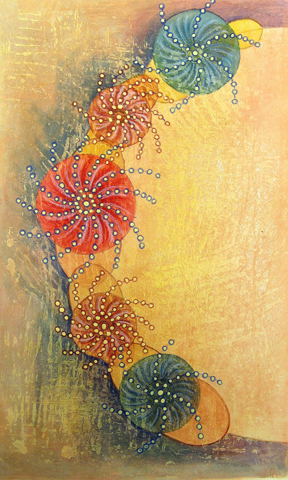 I have been creating paintings about the body based on clinical observations in my acupuncture practice. They are a compilation of human anatomy, landscape imagery, written words, medical notations and symbols. 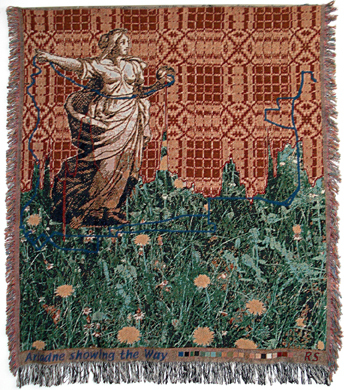 "Ariadne showing the way" eveolved from an earlier "to walk the line," which is part of Digital threads <digital threads.com>. It combines my interest in mythology inspired by weaving and GPS technology. The GPS tracks are grounded in everyday life, routine trips to and from work, shopping etc. here joined with a grander leap into history and foreign places via Internet connections. The GPS tracking of all my daily activities are part of my interest in working with patterning and new technology. Jacquard weaving, similarly explored uses of hand and machine technology. Weaving technology played an important role in the industrial revolution and in Babbage's early computer, as Ada Lovelace's reference "the analytical engine weaves algebraic patterns just as the Jacquard loom weaves flowers and leaves," indicates from 1843. 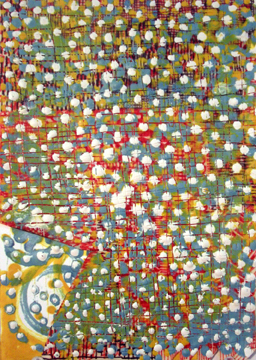 "Ariadne showing the way" explores floral patterns. In this case dandelions form my backyard replace traditional ornate floral constructs. The sky is made from a traditional mid 19th cent. New Brunswick, Canadian coverlet now in the Textile Museum of Canada collection. The overshot pattern is rendered here in a fake pixelation process. Ariadne, initially saved Theseus from the Minotaur with this simple 'ball of thread technology' that works so similarly to today's GPS. Here she stands over my house and directs me/the viewer into the opposite direction fo the blue GPS track, which goes to my workplace. Elevation data from the trip creates a dividing line between flowers and patterns, inside/outside, nature/culture, order/chaos, keeping them in a balance. The weaving was done from my design on an industrial Jacquard loom with a multi colored warp. A collaboration with illustrator Susan Estelle Kwas, The Girl in the Moon cycles the reader through one full moon night to view all manner of mischief. 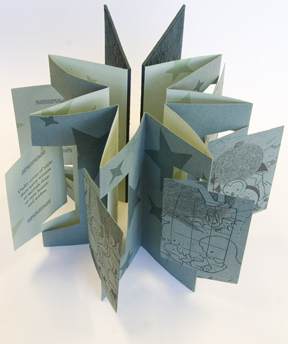 Using an innovative structure designed by Hedi Kyle, the three-color illustrations float off the page and the book can be displayed as an accordion or in a star shape. Illustrations were printed with photopolymer plates and handset Artcraft was letterpress printed on duplexed Hahnemühle Ingres. Through the use of metallic and glow-in-the-dark inks, the book delights in both sun and moonlight. Boards are covered with indigo momigami and the book is packaged in a silver bubble-wrapped spacesuit. 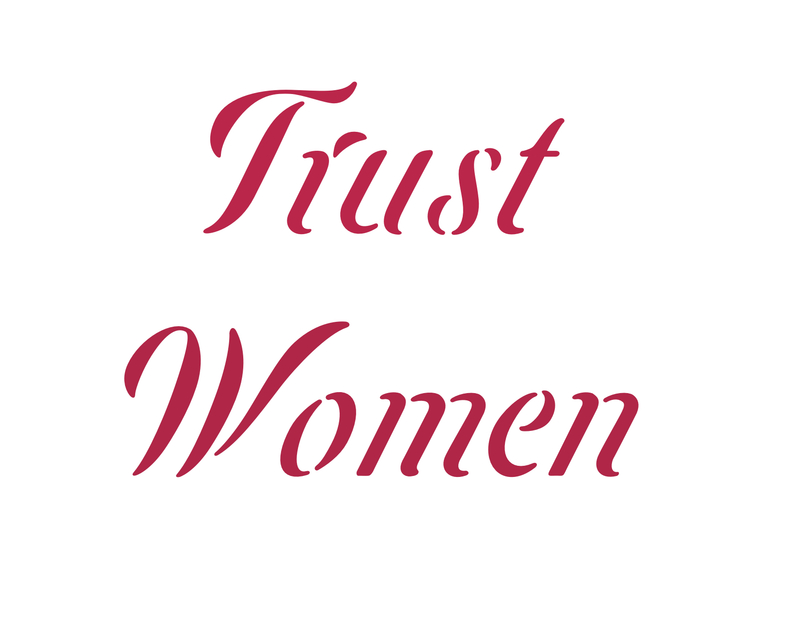 “Trust Women” was a motto of George Tiller, MD. Dr. Tiller was the medical director of Women’s Health Care Services in Wichita, Kansas, US, a clinic which provided services, including abortion, to women who were over 21 weeks pregnant. In 2009, an activist opposed to women’s reproductive freedom murdered Dr. Tiller while he attended church. Dr. Tiller had assumed his father’s family practice which included abortion after the elder Dr. Tiller’s death in 1970. Ths stencil is produced in an edition of 100 using the font, Ciseaux in 10 ml polyester. Please use the stencil freely. There is no copyright, although the work is created by Alice Dubiel in 2009, the stencils in 2012. Ciseaux was inspired and is dedicated to the art of paper cutting.